This is a new venture on the first day of the first year for me, Dixie Redmond. 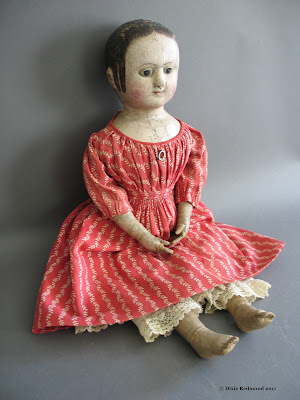 I hope to put links here to all the Izannah sites out there - pictures and writings - for dollmakers and Izannah lovers everywhere. Happy New Year, Izannah! Thank you for starting this blog Dixie! 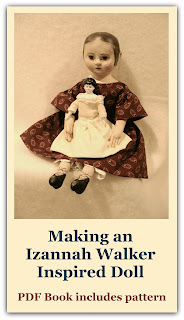 I'd love to learn more about Izannah Walker and her dolls. My hero! Love you to pieces Dixie. I am so glad that you listen to the drummer in your head. Big blessings for you this new year. THANK YOU SOOO MUCH FOR STARTING THIS BLOG DIXIE. You will be truly blessed for passing on your knowledge and helping others. How generous of you to share this wonderful woman's story and her amazing dolls!! Thankyou so much, I'll be back often.